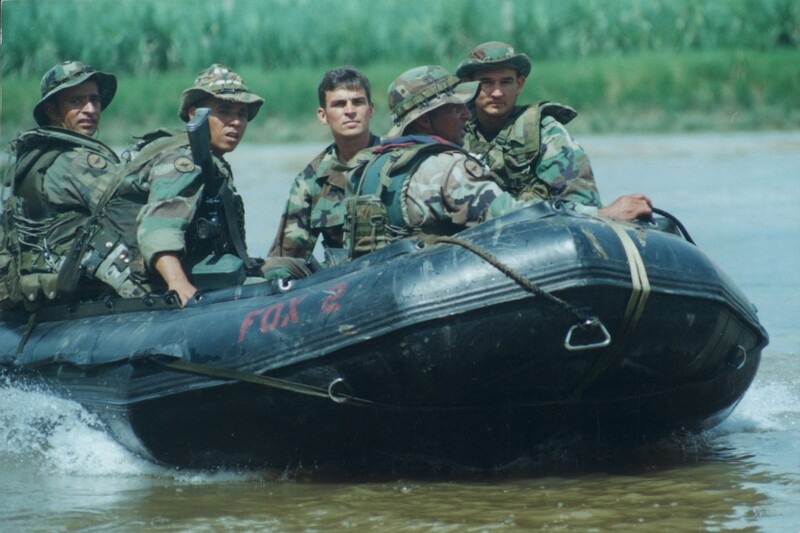 US Navy SEAL lieutenant on special mission training Colombian special forces anti-narcotics commandos in riverine tactics on the Cauca river in southwestern Colombia in 1999. © Photo by Steve Salisbury. All rights reserved. Pres. Santos made a public invitation to Uribe and Pastrana to set aside political and personal differences to join Pres. Santos at the February 4 Plan Colombia commemoration with Pres. Obama in Washington DC. Pres. Santos had been hyping the commemoration as it approached, touting Plan Colombia as one of the world’s great successes, a view echoed by a number of US officials (present and past), some who had a hand in Plan Colombia, and by Democratic and Republican members of the US Congress. According to the White House, the 15-year commemoration of Plan Colombia, which is reported as beginning in July 2000, had to be held in 2016 for scheduling reasons, coincidentally in the midst of the US presidential race and as the Colombian peace process approached the March 23 date aimed by Santos for signing an overall peace accord. When Pastrana left office in 2002, there were 102,071 hectares of coca crops identified by the United Nations Office of Drug Control, down from 144,807 in 2001. In 2013, that figure was 48,189, but it increased to over 69,000 hectares in 2014. According to experts, the rise is due to a variety of reasons–including the suspension of aerial-spraying eradication of illicit crops because of court orders over potential environmental and health concerns. Pres. Santos and the FARC reject Pastrana’s characterization of their partial agreement on the drug issue and respond that what has been agreed to is a more sensible approach (in their eyes) toward the drug problem, whereby the government would put more focus on the transnational drug-trafficking and money-laundering parts of the chain and give local communities more responsibility at their own level to handle the matter themselves, with the national government supervising and keeping its right to intervene, if deemed necessary. Critics worry that allowing communities whose economic life-blood derives heavily from the illegal drug industry could be like putting a cobra in a mice bin. Pastrana was once on Pres. Santos’ council of external peace-process advisers, before resigning from it citing differences. But some wonder if Pastrana’s stepped-up criticism of Santos’ approach on the peace process may be inspired in part by other reasons. Perhaps an unsaid reason of why Pastrana is critical of Santos’ handling of the peace process may be envy or ego because Pastrana’s efforts of peace negotiations with the FARC during his presidency failed in bitter fashion—whatever one thinks of the Santos-FARC peace process or disputes the reach of its advances. “Pastrana had his 15 minutes of fame, and he failed,” one FARC peace negotiator told me. While Pastrana’s differences with Pres. Santos didn’t stop Pastrana from accepting the invitation to attend the honoring of Plan Colombia and to hob-knob at the White House, Uribe declined the invitation, saying that there is nothing to celebrate, citing Pastrana’s same criticisms of Plan Colombia. A senior adviser to Uribe during Uribe’s first presidential term summed things up to me about the Uribe-Santos situation by saying that, in his view, the problem isn’t so much about whether or not to talk with the FARC, but that there is such bad blood between Uribe and Santos, whom Uribe detests as a “vile traitor” and doesn’t want to see getting a Nobel peace prize for what Uribe sees as selling out the country. And Pres. Santos has stuck it to Uribe at times. This former senior adviser, who says that he still meets with Uribe occasionally, thinks that the relationship between Uribe and Santos is irreconcilable, at least now and as far as he can see. In a way, Uribe seems to detest Santos perhaps more than Uribe seems to detest the FARC. The FARC issued a statement before the White House commemoration of Plan Colombia, calling Plan Colombia a disaster that had aggravated the conflict, ruined countless lives and didn’t solve the drug issue. The FARC statement was no surprise, since Plan Colombia has negatively affected the FARC war chest, and since Plan Colombia’s military component was initially allowed by the US Congress to attack FARC units deemed to be involved in direct drug-involvement, and later widened to attack FARC units not deemed to be directly involved in narcotics involvement.